Hamilton (or Hammy, as he likes to be called) is our favorite canine volunteer. This adorable rescue is a bright spot in the residents’ break time at Calvary every few weeks. Hammy’s visits are extra special because they spark stories of pets in the women’s past. Hammy’s adoptive mom Melanie also shares Hammy’s inspiring story of resilience with women at Calvary. Hammy, where are you from and where do you live now? I spent the first four years of my life in a testing laboratory. 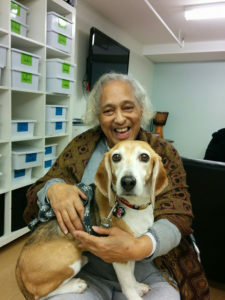 After the testing was complete, a nonprofit organization called the Beagle Freedom Project arranged for me to leave the lab, which saved my life. I was one of the lucky ones, because I got out and now have a chance to live in the big world! I was fostered and then adopted by a travel writer, Melanie, and we live together on Capitol Hill. I can catch a treat dropped from seven feet! Once a month, Melanie and I visit the residents between their afternoon classes. Sometimes Melanie sets up scavenger hunts and I sniff out treats and do tricks and make the residents laugh. I had been volunteering visiting patients at a hospital, but the smells and sounds made me nervous. Melanie remembered that she had visited Calvary several years ago and had really liked Elaine Johnson (Calvary’s education coordinator). So Melanie asked me if I would like to volunteer there instead. I did! Because I like being wherever Melanie is. What do you like best about Calvary? I can walk from home! And when I arrive, I get treats! And attention! When I visit, I get to sit on the couch, and I get lots of love. The residents pet me and sometimes talk about dogs they had growing up. Many of them say, “When I land on my feet, I want to get a dog!” That makes me happy. What has surprised you most about Calvary? Endless reserves of TLC. Never enough treats.